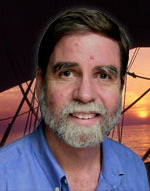 Rick Spilman is a writer of tales about ships and the sea. His novels, Hell Around the Horn and The Shantyman, are set in the final days of the great age of sail. Rick is the founder and host of the Old Salt Blog, a virtual port of call for all those who love the sea. He is also a founding partner in Old Salt Press, LLC. Professionally, he has worked as a naval architect (ship designer) for several major shipping lines. An avid sailor, Rick has sailed as volunteer crew on the replica square-riggers “HMS ROSE” and “HMS BOUNTY,” as well as sailing on modern and period vessels along the New England coast, the west coast of Florida, the Caribbean, the Great Lakes and the southwest coast of Ireland. I will be participating in Jersey City’s 9th Annual Book Festival — Tales of Our Cities, in Van Vorst Park this Sunday. I will have a table with my books and books by other Old Salt Press authors starting at 11AM. I will be reading from my new novel, Evening Gray Morning Red at 3:30PM. I will also be giving away five Advance Reading Copies (ARCs) of the novel. Be sure to stop by and say hello if you are in the area. In the spring of 1768, Thom Larkin, a 17-year-old sailor, newly arrived in Boston, is caught by a Royal Navy press gang and dragged off to HMS Romney, where he runs afoul of the cruel and corrupt Lieutenant Dudingston. Years later, after escaping the Romney, Thom again crosses paths with his old foe, now in command HMS Gaspee, cruising in Narragansett Bay. Thom Larkin must face the guns of the Royal Navy with only his wits, an unarmed packet boat, and a sandbar. To celebrate The Shantyman being chosen as one of the Best Indie Books of 2105 by Kirkus Reviews, we are having an impromptu promotion. Here is how it works — today and tomorrow, The Shantyman will be available in Kindle format on Amazon for only 99 cents! The price will then step up to $1.99 on December 26th for two days, then up to $2.99 on December 28th for two more days, before returning to the regular price of $4.99. Click here to get your copy. With eloquent accuracy, Spilman’s novel captures the life of a 19th-century sailor…. Spilman’s colorful, well-researched novel will enthrall both sailing enthusiasts and landlubbers. A fabulously gripping sailor’s yarn. I am very pleased to learn that my latest novel, The Shantyman, is being featured as one of Kirkus’ Indie Books of the Month for August. The Kirkus starred review from last June, called The Shantyman …a fabulously gripping sailor’s yarn. The review also says: With eloquent accuracy, Spilman’s novel captures the life of a 19th-century sailor…. A profound understanding of nautical terminology and procedure is also evident, yet the author is careful not to confuse readers who don’t know a “crojack” from a “spanker.” … Spilman’s colorful, well-researched novel will enthrall both sailing enthusiasts and landlubbers. To read the whole review click here. With eloquent accuracy, Spilman’s novel captures the life of a 19th-century sailor. George Anderson, retired from a lifetime at sea, recalls a voyage from New York to Australia and back in 1870 in the wooden Kennebec-built clipper Alhambra. Anderson was barely seventeen when he signed aboard as an A.B. or able seaman (able to hand, reef and steer). He can save the ship and the crew, but can he save himself?